It’s been a busy week! But I had time to make some yummy Irish Soda Bread. It’s such an easy recipe and only takes a few minutes to make and then pop in the oven. It makes a hearty dense bread that goes great with my cup of tea. I added raisins, but you can add any type of dried fruit or nuts, or just make it plain. I tweaked an old recipe I had, so I thought I would share what I did. 1 Cup of Raisins (Optional) (I measure them out into a bowl and soak them in hot water for a few minutes to plump them up before I add them to the mixture.) You can substitute dried cranberries, a mixture of raisins, currants, or whatever dried fruit you like. I love dried pineapple, so I am thinking of using it in my next batch. Preheat oven to 350 degrees. Get out a cookie sheet and line it with parchment paper. Soak the cup of raisins. I use my Kitchen Aid stand mixer with the dough handle, but you can use a bowl and strong wooden spoon or hands. Put in the flour, baking powder, baking soda, and sea salt. Mix just to incorporate the dry ingredients. Add the buttermilk and raisins and mix to form a dough. Take large ball of dough out of bowl and separate into two even balls. knead for just a few minutes on a floured board to get a nice ball. (i kneaded it for about 1 minute, tops!) Flatten the balls a little on the bottom and place them next to each other on the parchment paper lined cookie sheet. Take a knife and cut a large X in the middle of each loaf. I also sprinkle a teaspoon of sugar on the top of each loaf to make it look pretty, but you can skip this if you don’t want any sugar in it. Or you can dust it with some whole wheat flour, too. Bake for about 50-60 minutes. You can do the ol’ bread test by putting a toothpick or knife into the middle of the bread and if it comes out clean, your bread is done. If it still has some dough sticking to the knife or toothpick, add an additional 5 minutes. Bread will be a pretty golden brown along the top when it is done. Also, I have a gas stove with an electric ignition, so baking times may vary, so I’d do a quick check at 40 minutes just to be sure it doesn’t burn. I ate it warm, seconds after I took it out of the oven! HA! I also used it for toast and put yummy butter, homemade tangerine preserves or just ate it plain. All were delicious options! 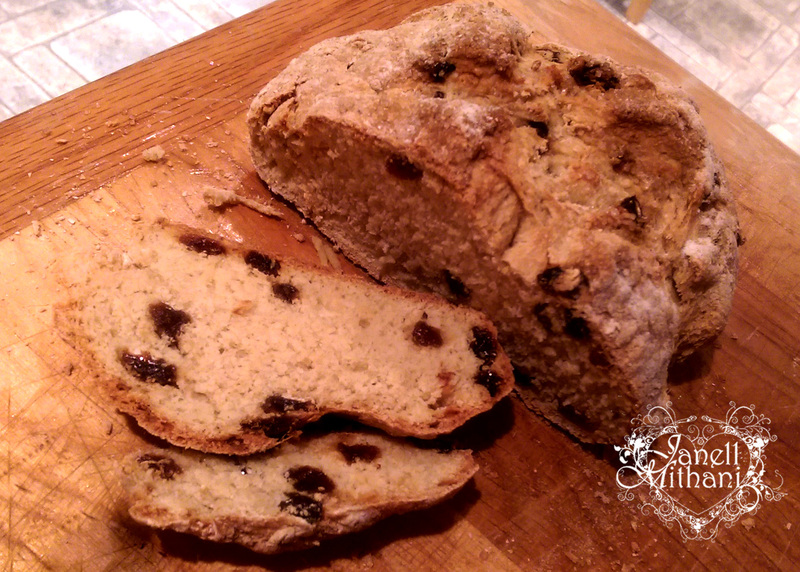 This entry was posted in Art and tagged baking, Irish soda bread. Bookmark the permalink. Thanks for sharing your recipe, Janell! It looks yummy. Thanks, Jill. It was yummy. Would this be one form of Mothering Sunday bread…served in the middle of Lent to the fasting nuns ? Thanks, Eva. Hopefully, we all have a sunshine filled week. It looks so great Janell, nothing better than fresh bread (with dabs of butter). Looking forward to seeing your new art pieces!